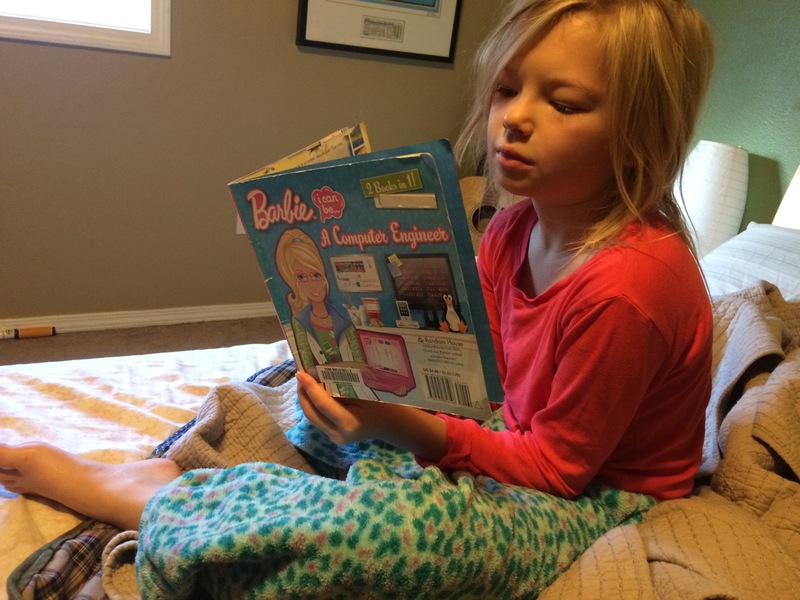 By now I think the entire internet has heard about the book Barbie: I Can Be a Computer Engineer. If you have missed all the commotion, blogger Pamela Ribon exposed the book last week for the completely sexist crap that it is. Although the title would lead you to believe Barbie has grown a brain and developed some tech aspirations, the book itself just highlights how she gets men to do work for her and then takes credit for it. But it does detail a serious problem when Barbie gets a virus on every computer she touches, and loses all of Skipper’s school assignments. Don’t worry, it is resolved by a good, old fashioned, pillow fight. Which is my immediate reaction when someone ruins my life with their tech incompetencies. Her and me both. Not to mention that Random House published it. But what stuck with me more than her response to the book was her mention of wanting to be a computer engineer. I shouldn’t be surprised, since she does like computers and she loves coding programs geared for kids, but it wasn’t an aspiration I had heard her vocalize before. Despite huge efforts by universities to recruit women into tech fields, and many schools reaching 50% male to female graduation ratios in tech fields, women still only make up 25% of the tech industry. So I should be thrilled that my daughter wants to enter in and make a dent in that number, right? I’m not. I’m more terrified of what she will experience if she does. For years the focus has been on getting women into tech. We need more educational toys geared toward girls. We need more role models, more extracurricular opportunities, more scholarships. The pipeline is where the problem is. Except the pipeline can’t explain why 57% of women who actually enter the tech industry will leave. That doesn’t sound like a broken pipeline. That sounds like a corrupt system. Sexism in the tech industry isn’t just a book that shows women as incompetent and greedy. It is no maternity leave, unrealistic expectations, inflexible conditions for mothers, and the uncomfortable feeling of having nobody else like you around. It is jokes and comments, looks and advances. It is the majority of women at a tech conference being dressed in tight shirts with a logo across their chest even though they know nothing about the product they are wearing. I am glad that people are angry about this book. However, I hope they are outraged about this reality. The reality that women are having their lives threatened every day for speaking out against sexism in the gaming industry. The reality that Uber’s Senior Executive threatened to hire people to spread dirt on the personal life of a female reporter who spoke poorly about their company. The reality that Tinder founders left off the name of a woman co-founder in news articles because they felt having a woman listed would devalue the company. I want to be excited about my daughter loving computers. I want to encourage her to do hard things and follow what she loves. But I want her reality to be much different when she gets there. That will take more than people getting upset about a book. It will take more than funneling woman into an industry that doesn’t treat them well. It will take a lot more than yelling “pillow fight” when it is a much bigger problem. We need more women in technology because there is no balance. There are still too many men who are writing the code and too many women who are writing the marketing copy. Men are slowly getting less dumb. Women are slowly getting better at calling out sexism. In the mean time I’m trying to raise one tough girl and 3 sensitive boys.